Is it worth upgrading to the new, better looking Vision+ box? BT Vision is the telecom giant's on-demand TV service and, for better or worse, we on Techradar have been plugged into it since May 2007. At the heart of the system is the V-Box, a network enabled PVR capable of serving up content from BT's online library or Freeview TV. History tells us early adopters are cursed and our early experiences with the fledgling system did indeed leave us cursing. The V-Box was highly crash-prone and the content offered by BT underwhelming. We weren't put off and nor was BT. Doggedly it updated and upgraded the original V-Box's firmware, ironing out its problems and - credit where credit is due - created a solid, dependable and reliable hard disk recorder. Software updates couldn't however cure the V-Box's most striking ill - it was pug ugly. All that - and more - should be changed with the arrival of the new BT Vision+ box. Straight out of the box, the Vision+ box feels like a slick and modern piece of home entertainment kit. Gone is the old machine's dower gun metal grey and in comes piano black. When you move beyond the glossiness of the new machine, however, finding differences between it and the old machine becomes a challenge. 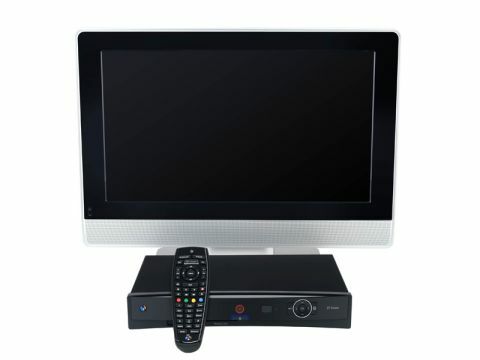 Their specifications, for example, are near identical - twin Freeview tuners, 14-day EPG and a 160GB hard disk. Sure the two machines' rears look radically dissimilar, but they both sport the same slew of connectors, albeit in different arrangements. That said, the Vision+ box has every connector you're likely to need. BT claims the new black Vision+ box is more energy efficient than the old one. It's suggesting a drop of 12% and asserts the improvement helps the machine "meet the new more demanding EU energy regulations". We can only applaud that improvement. The new remote is - as you'd expect - black, but beyond that looks remarkably similar to the original. BT claims the newer device has bigger characters on its buttons to help in reduced lighting. There are also a few extra buttons on the machine itself, notably a handy instant record button and a standby button too. Setting it up is simple and fast - wire it all up, switch it on and you'll be up and running in minutes. Quite why BT has emblazoned "start enjoying great TV in just 30 minutes" on the box is a mystery. In use - once more - the difference between the old box and the new Vision+ machine are hard to spot. Indeed, try as we might, we couldn't spot any UI improvements, tweaks or changes. That in itself is no bad thing - BT has developed its interface well. The Vision+ box is a refinement of the original BT Vision PVR and in isolation, a fine PVR. Upgrading your original machine will cost £200 and, considering the slim improvements on offer, it's just not worth it. Given BT is working on a Freeview HD-enabled box we say keep your powder dry. Remember too Project Canvas is developing nicely. As such, now just isn't the time to buy - no matter how good looking the machine. The machine's improved looks and lower power consumption coupled with a straight forward interface all add up to make this a sold PVR. In use it also feels subjectively quicker than its predecessor. Put the old and new BT machines next to each other and there's no absolute must-have upgrade. Support for Freeview HD, for example, would have been a brilliant addition. As it is, BT claims to be working on a box which will support the new broadcast system, but hasn't said when.